Today was basically a travel day. I got up early and walked around Lahaina again, picking up some Starbucks along the way. Took lots of photos, as always. We had to wait in the Maui airport for quite a while for our 29-minute flight to O'ahu, where we all got "leid" upon entering the terminal. In the afternoon, we had some free time on the beach. Susan and I rushed down to Waikiki as soon as we got our bags into our rooms at the Ohana Island Colony (or whatever it was our hotel was called). Soon we walked up the beach a bit, saw Scott with his friends, then ran into Matt and his friend, who ended up going for a swim with Susan while I stayed up on the beach, watched their stuff, and absolutely loving the view and the situation. Waikiki beach, with luscious palm trees, a yellow catamaran coming into the shore, surfers, swimmers, sunbathers, ukelele music coming from a nearby hotel, Matt and Susan enjoying the warm ocean, and the magnificent Diamond Head volcano dominating the eastern shore as the sun sank in the west. It was one of my favorite moments of the trip. 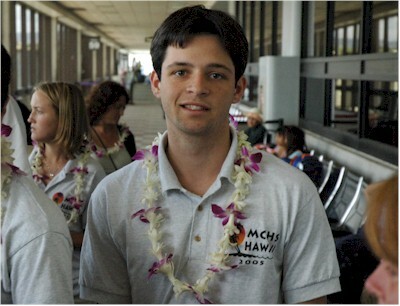 Here's Matt in the Honolulu airport with his lei.